The Lions Motto is “We Serve." 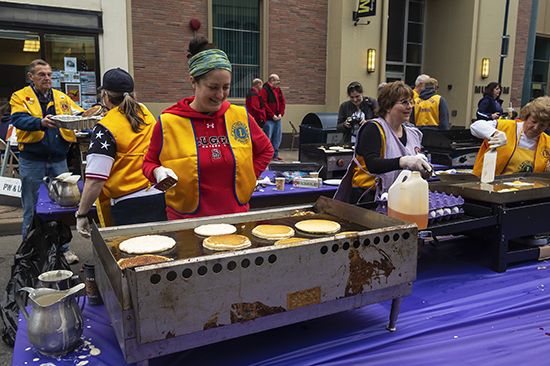 For 93 years our Club's members have followed this mandate through the creation and support of a wide variety of facilities and service projects. 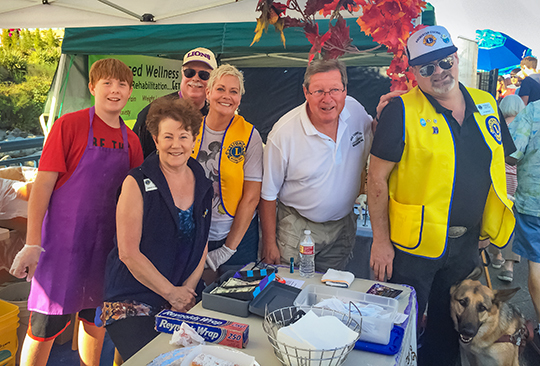 While Sight is the major institutional goal of Lionism, our bylaws also direct us to take an active interest in the Civic, Cultural, Social and Moral Welfare of our community. 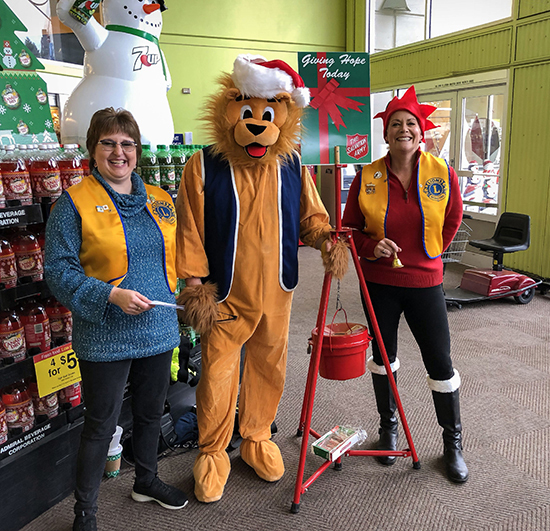 We welcome membership interest from any man or woman of legal majority, good moral character and community reputation who recognizes Lions as a vehicle through which they can make a contribution to the community, expand their acquaintances and make some wonderful friends. 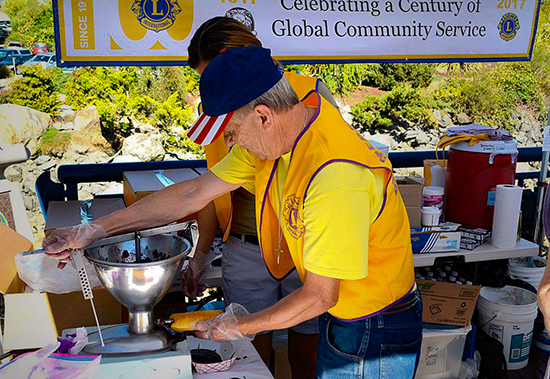 The Lions are the largest service club organization in the world with over 1.5 million members. The members of our club represent all walks of life: employees, business people and retirees - male and female members. 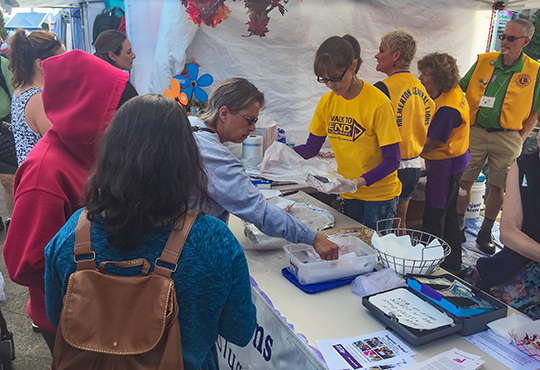 Though we come from every corner of the social, economic and religious spectrum, we are united in our desire to provide aid and support to those in our community who are in need. If you are motivated to offer help to your neighbors who can benefit from it, you will find many opportunities for personal fulfillment by joining with us. 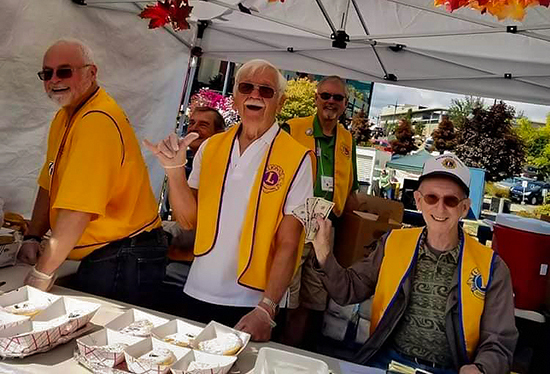 In addition to his accomplishments addressed in the obituary, perhaps his most lasting legacy are the legal services he provided that culminated in the establishment of the Bremerton Central Lions Charitable Foundation in 1987; currently the Foundation provides nearly $50,000 annually to worthy causes in the Bremerton Community. Stan suffered immensely from Parkinson's desease in the later years of his life, but his efforts to serve his community never ceased. He will be missed enormously. 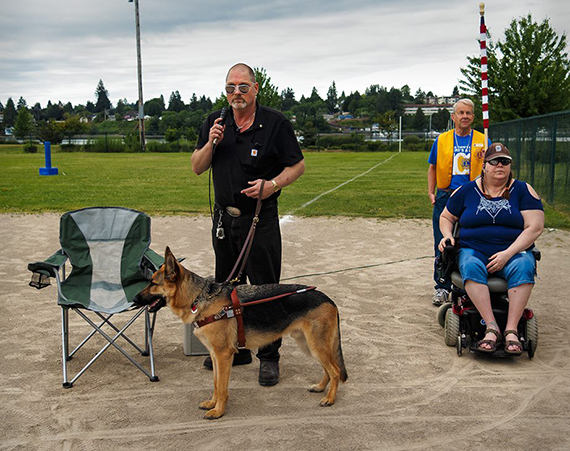 Stan is pictured here, being honored at Lions Park on July 25th, 2018 for his many years of service on behalf of not only the Park, but also numerous recreation projects in the City. 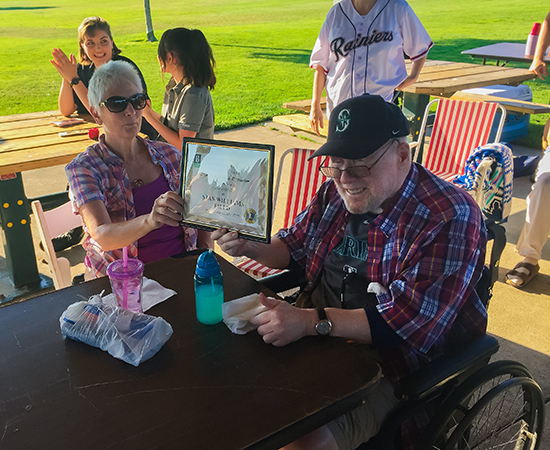 In recognition of his persistent and tireless contributions, the Parks and Recreation Department has re-named Softball Field #2 "Stan Williams Field." Stan is shown here receiving the certificate proclaiming the award. 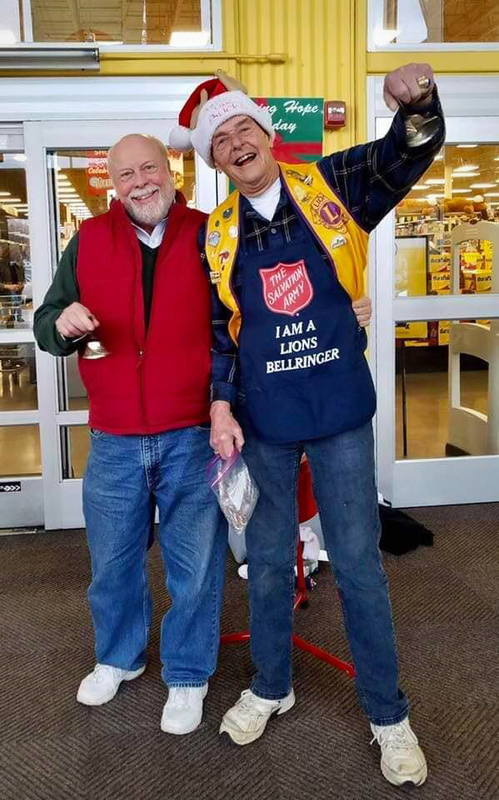 On December 8th, 2018, volunteers from the Bremerton Central Lions Club relieved the Salvation Army from hiring Bellringers at all three entrances at the Fred Meyer store in Bremerton, as they have done for many years. Committee Chair Jeff Reynolds (pictured above (L) with Lion Mike Peterson once again organized a flawless performance by our club volunteers. 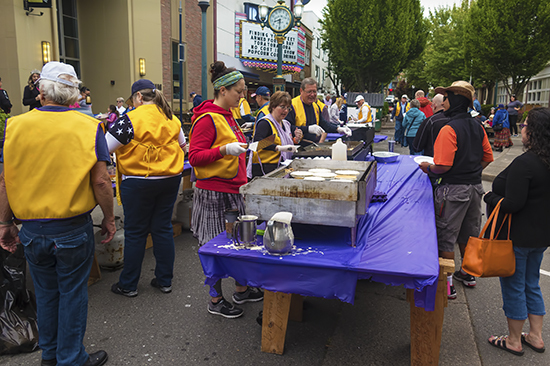 On November 21st, the Bremerton Central Lions hosted a combined Service Club Luncheon at the Admiral Theatre in downtown Bremerton. 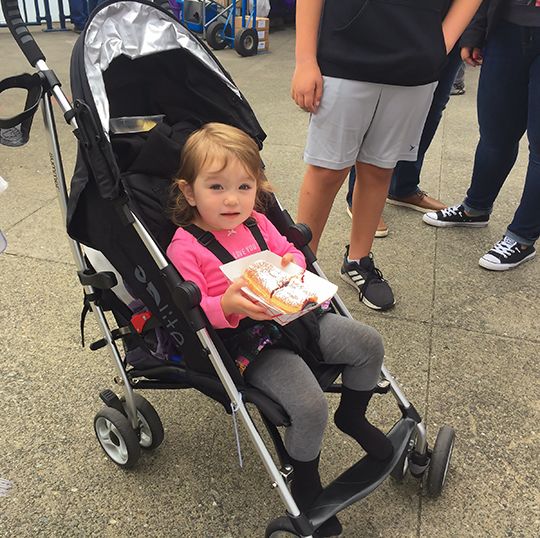 Read all about it on the November Tattler page! (Link may not work with Firefox - try another browser if so). 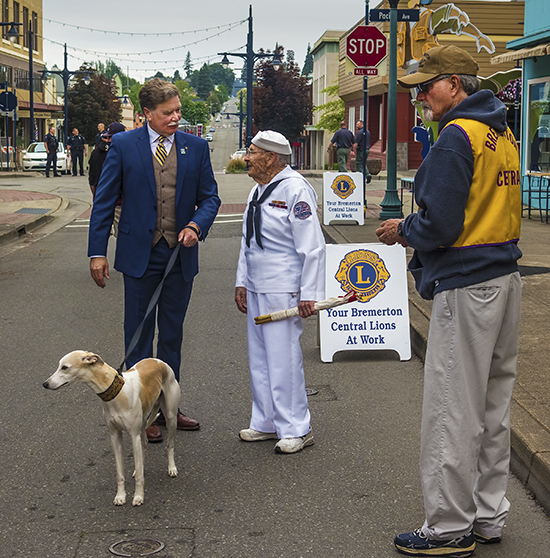 The Bremerton Central Lions 31st Annual Dinner and Auction was held again at the Admiral Theatre in downtown Bremerton on October 27th, 2018. 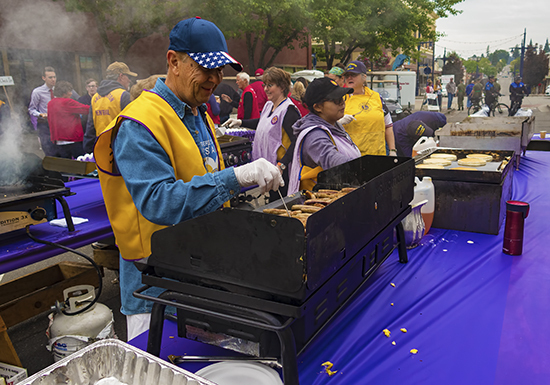 Thanks to the stellar leadership of Committee Chair Patty Lent and the tireless efforts of all Committee members, the event grossed $58,000, easily the highest amount in recent memory, and possibly the most ever. Undoubtedly, the effort was boosted by the return of Auctioneer Brian Orwiler, who was assisted by Master of Ceremonies Frank Shiers, and also by Lion Mike Peterson. 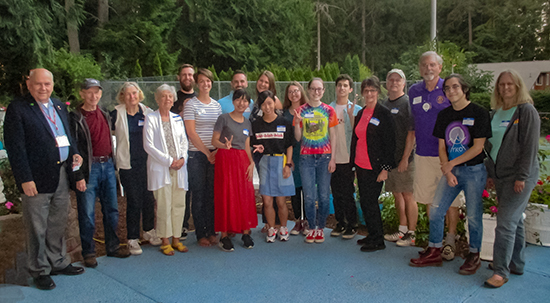 The focus of this year's event was the youth job training program at Bremerton's West Sound Technical Skills Center, and many in attendance agreed that it was the most worthy recipient ever chosen by the Committee. Also notable was the splendid job done by the two Miss Kitsaps in selling Destination Raffle tickets to members in the audience. Thanks in large part to them, that effort raised more than double the highest amount ever done by the raffle. Following the holidays, Patty and the Committee will begin planning next year's Auction. Let's all get together and make that number go even higher! 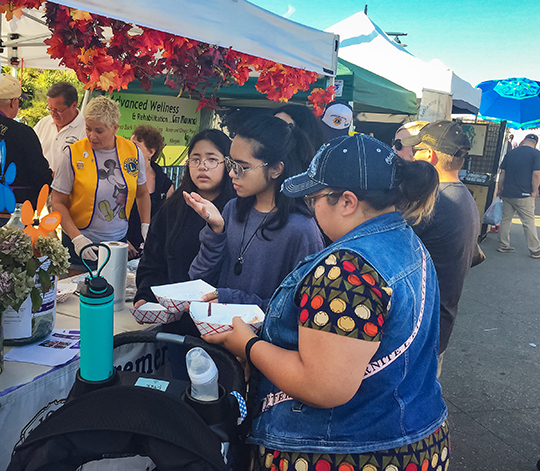 https://thisandthatnorthwest.com/category/meetthevendors/ - Scroll down to Bremerton Central Lions. 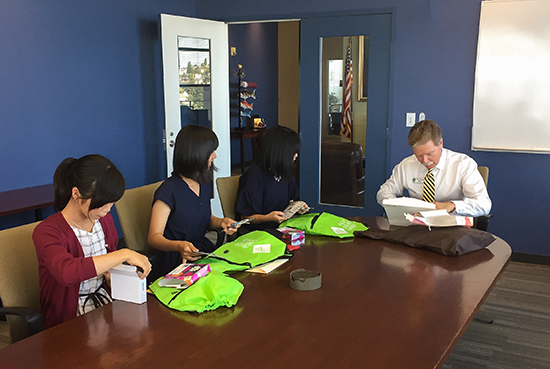 The three students from Bremerton's Sister City of Kure, Japan visited Bremerton from July 23rd to August 19th. 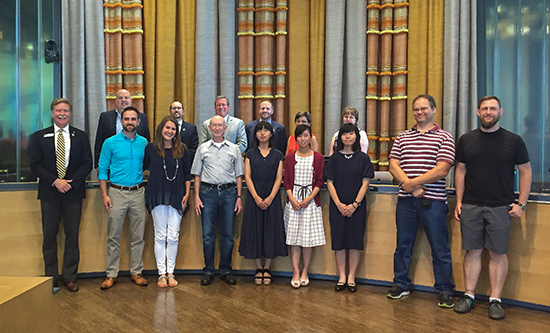 During their stay, they enjoyed many local experiences they had anticiipated, such as going to a Mariners game, and visiting the Pike Place Market and the Space Needle. As usual, they were not looking forward to leaving. 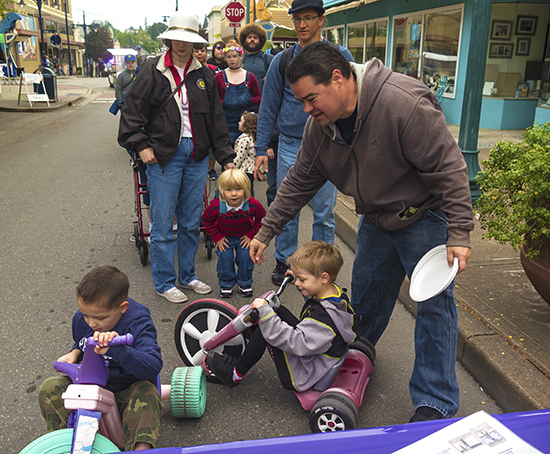 Here are a few pictures of their time in Bremerton. 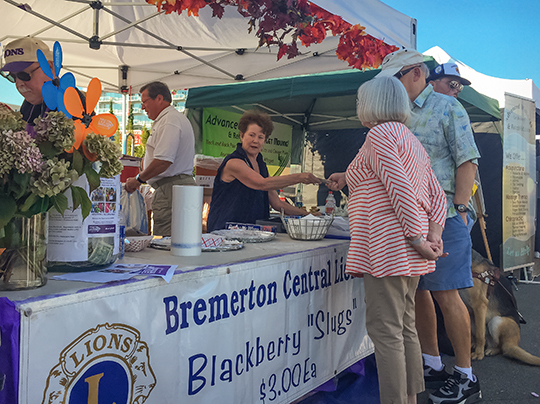 On June 29th, 2018 the Bremerton Central Lions sponsored a scramble golf tournament at McCormick Woods Golf Club. All net proceeds went to benefit Lions Project New Hope NW. It was the first golf fundraiser for our Lions, and we were proud to present a check to Project New Hope for $1,000. Plans are already underway for the 2nd Annual Tournament in 2019. 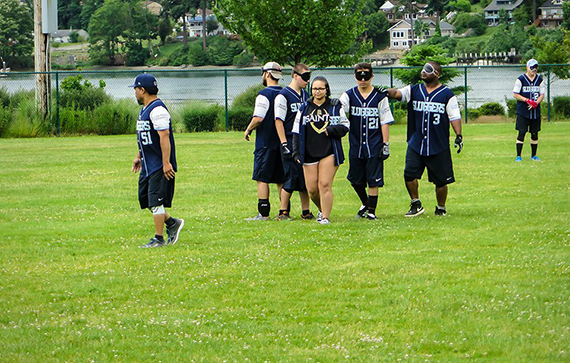 On June 2nd, 2018, the Club sponsored the 2nd Annual Beep Ball game at Bremerton's Lions Park , featuring the Seattle South King Sluggers vs. a team consisting of first responders from Kitsap County, including the Bremerton Police and Kitsap County Sheriff Departments, as well as local firefighters. 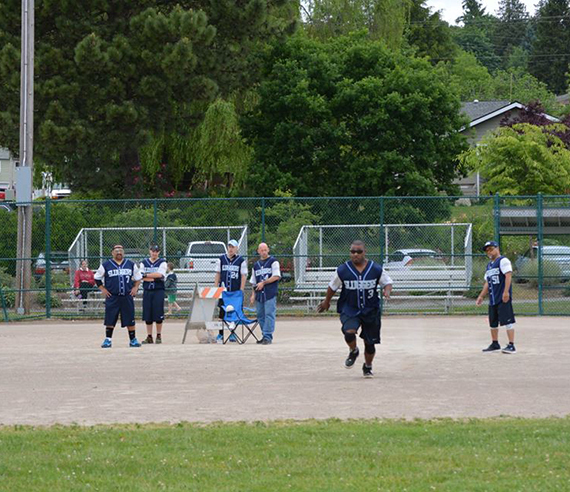 The Sluggers are an all blind team from Seattle that plays in an organized league. 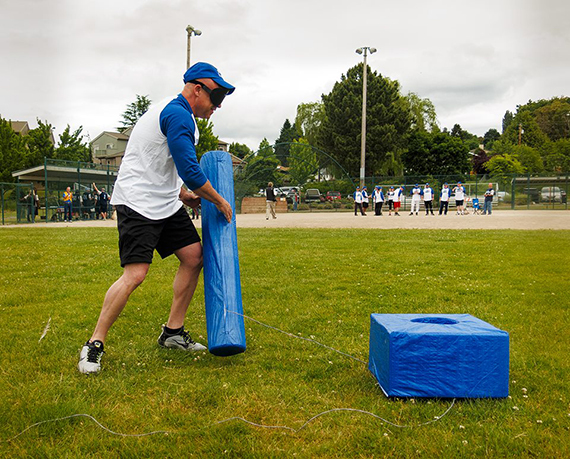 Players on both teams are required to wear blindfolds whenever they leave their dugout to either go hit or take the field. They are always led to their defensive positions or to home plate. 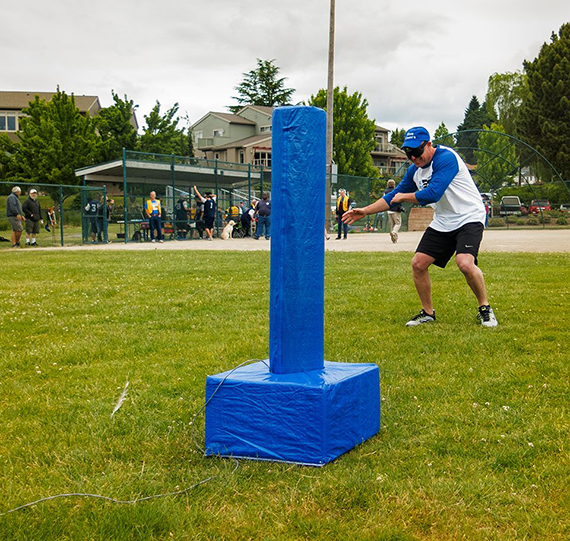 Beep Ball is essentially slow pitch softball, but with several twists. The pitcher and catcher are the only sighted players and both are on the batter's team. 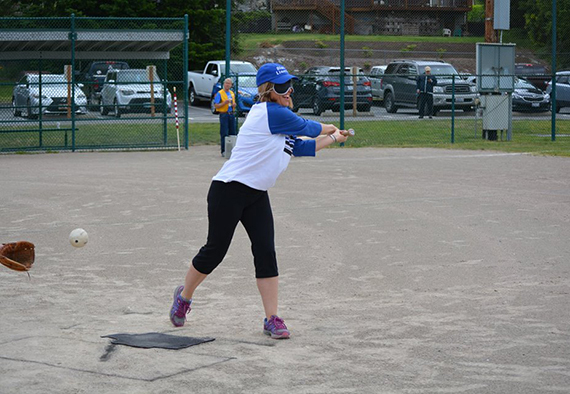 When a batter makes contact with a pitched ball, they run toward a "base" - positioned down the first or third base line - that also beeps after a pitched ball is hit. One volunteer has a remote control that determines which base beeps. The base is actually a styrofoam stanchion. If a defensive player gains control of the batted ball before the batter reaches the beeping base, the batter is out - if not, the batter's team is credited with a run. Unlike last year, both the Sluggers and the opposition had much difficulty making contact with the pitched balls. 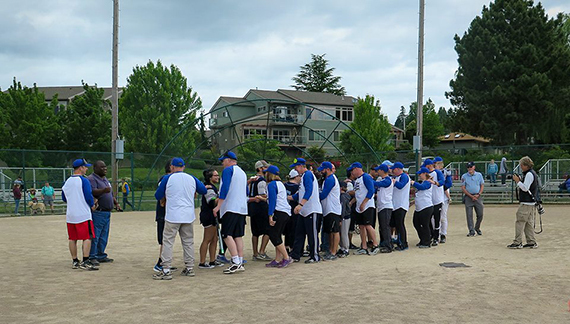 The Sluggers finally got something going late in the game and scored two runs, winning by a 2-0 score. Everyone had great fun and learned much about what life is like without the gift of sight. 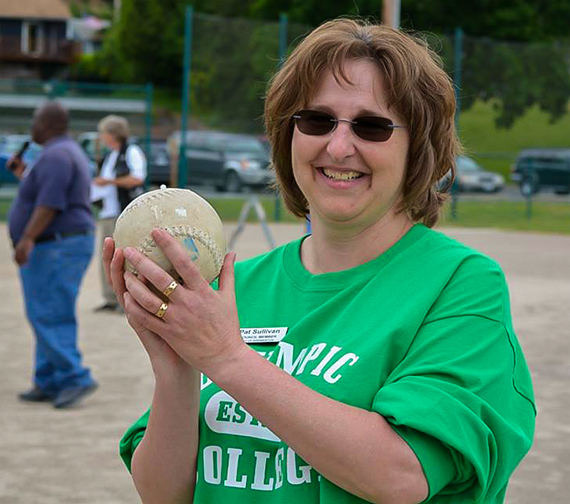 The Sluggers plan to make an annual visit to Lions Field. Unfortunately there were few pictures taken this year so here are some images from the wonderful day on June 3rd, 2017. Lion J.R. Kinnison welcomes the fans. Lion Pat Sullivan presents the Beep Ball. The Sluggers are led to their defensive positions. There's a guy who knows his way to the base ! 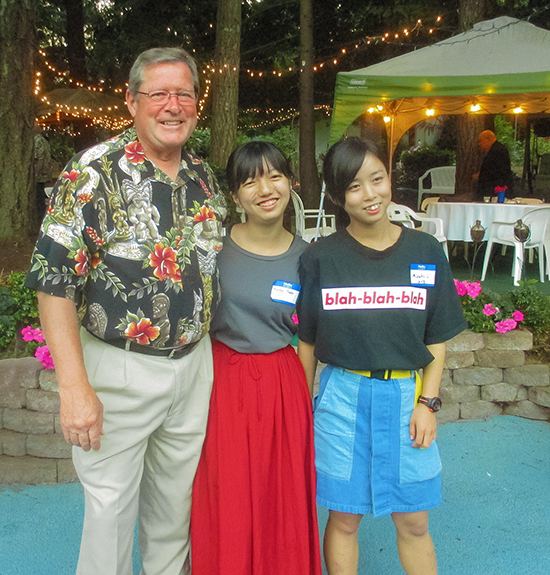 A great time was had by all ! 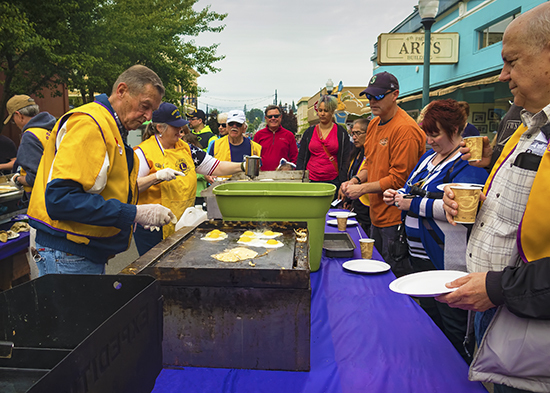 Here it is, another fabulous Lions Pancake Breakfast on 4th Street in Bremerton - preceding the equally famous and fabulous Armed Forces Day Parade in the downtown area on May 18th.